We’re heading out to the Golden Circle, and within 5 minutes we’re lost. Seems my wife and my geographical senses aren’t meeting anywhere, and we pull over for directions. Trouble is even on a monday morning we cant find anyone to ask. Eventually we do, and a really kind young couple navigate us to the road. Within 15 minutes we’re in the countryside with a real sense of adventure. We’re on the way to Pingvellir, pronounced Thingvellir, seat of the 1st Icelandic parliament and the site where the continental plates of North america and Europe virtually meet. On the way we pull over a couple of times to wander along the side of the road. That’s what we find in Iceland – a lot of interesting things to see and do by the road, unsignposted, unknown, just waiting for people to discover. The weather’s great, so I celebrate by putting on my shorts for what will be the last time on the trip. Our sandals however will remain untouched throughout. We’ve been warned the Golden Circle will be chocabloc with tourists, so it’s refreshing to see that that’s relative to Iceland. It may be a lot of tourists by Icelandic standards, but it doesn’t feel overwhelming at all. The site is interesting, but noting too special to us, so we move on towards Geysir. The road quickly becomes dirt and none too good, and we pull over in the middle of nowhere to climb a small mountain. We’re shocked to learn that a cave midway up the mountain was a coffee and pastry shop 80 years ago – why couldn’t they hang in and wait for us ?- and we spend a pleasant hour scampering around. After my son has suffered his requisite injuries (he’s 13, what do you want ?) – he scrapes up his leg and hands – we move on to Geysir. We stop at a petrol station shop to load up on all kinds of Skyr drinks – we should be counting how many we’ll have- and head to Geysir. It’s pretty cool although nothing like Yellowstone and not quite as awesome as Rotorua, New Zealand. But again it’s got ample scampering opportunities and you can stand right next to the Geysir and get soaked which we assume is our obligation and do. From there we go to Gulfoss. It’s impressive but not quite wild enough for us. In Iceland part of the joy of the great sights is that you can explore around them for hours, and the Gulfoss experience seems too sanitized and conditioned for busloads of tourists to allow it to be exciting. We move on quickly. We’re staying the night in a town called Selfoss. It’s only our 2nd night in Iceland, so somewhat naively we expect a town and not a street. We look for a restaurant and settle for pizza as it looks like the only place open. Not even the opportunity to try shark, horse or puffin tonight. We check into our cabin which is the size of a closet. I gamefully try do my evening situps but give up as there’s no space anywhere for me to lie down. We choose to eat breakfast in town in the morning, but when we leave at 8am we discover the town only opens at 10. we find a bakery open and get some coffee, juice and of course, Skyr. We leave heading on to Vik.The weather is ominous: dark clouds, drizzle and the look of a cold day. We stop at Seljalandfoss and put on every piece of warm clothing we have which isn’t much. We walk behind the falls which does present a most unusual view. But it’s cold so we move on, stopping at Skogafoss. It’s a huge waterfall and in more genuine Icelandic spirit, you can get very close up. We walk up the stairs and do a great walk, ending only when the wind comes up violently and threatens to blow us off the mountain. But anyone going to Skogafoss MUST climb the stairs and do some of the walk. We head to Vik. By now it’s pouring and we’re paralyzed. There’s so much to do but we’re afraid to get out of the car. We go to the restaurant by the Visitor’s Center and have soup and bread which we will have pretty much every day of the trip. When we leave the rain has picked up, if that’s possible. We run onto the black sand beach for about 10 seconds and move on. 45 minutes later we see the most bizarre sight. Miles and miles of green covered lava fields (we think). We have to investigate. we wake our son from his nap and urge him to go look. He’s worried it’s too cold so I tell him it’s warmed up. It hasn’t, but he goes anyway. Soon, he’s rolling, bouncing, jumping having the time of his life. There’s nobody else in sight. It’s incredible, and armed with notes and 2 guidebooks we still have no idea what this is, but it’s great fun. 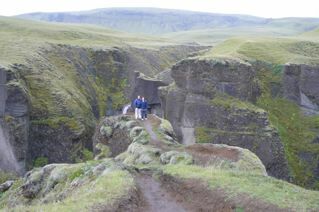 Eventually we move on and stop at Fjardrargljufur (we don’t try pronouncing much), a canyon near Kirkjub. It’s one of these fabulous Icelandic sights where you can walk, hike and climb forever and are free to kill yourself 10x over. The canyon is flanked by all sorts of cliffs and edges and you can walk (or crawl) to any of these edges. It’s quite nervewracking but exhilirating. And of course there’s virtually nobody there. We go into Kirkjub (Kirkjubaejarklaustur to be exact but try saying that) and have excellent coffee and Skyr cake at Systra Kaffi. It’s already 7pm but we decide to head on to Skaftafell, 45 minutes away. We get there and are rewarded as the sun has come out so we walk to the glacier. We start climbing about ending only when our son has to sprint back to the toilets. Eventually we get to our Hotel, Hotel Laki in the middle of you guessed it, nothing, and get to bed. An incredible day.